Our physiotherapy exercise classes are taken by experienced Physiotherapists and incorporate Pilates-informed exercises, and strength and conditioning principles as a safe and effective way to rehabilitate from injury. It is also a great way to improve overall strength, mobility, posture, function and well-being. Our exercise sessions are suitable for men, women, and children of all fitness levels and ages. 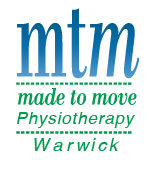 At MTM Physiotherapy Warwick, we offer private, semi-private or group sessions. As all of our classes are taken by Physiotherapists, health insurance rebates may apply. Our Group Exercise Classes are run by our Physiotherapist in a structured group setting and incorporate the use of equipment such as light weights, resistance bands and fit balls. These Pilates-inspired classes have a strength-focus, but also aim to improve core control, flexibility, balance and coordination. They are suitable for a range of fitness levels and ages and our Physiotherapist can modify the exercises as required to suit any minor injuries or issues you may have. For more significant injuries or multiple problems, our Physio Rehabilitation Consultations may be more suitable. Our Physio Rehabilitation Consultations at MTM Physiotherapy Warwick is suitable for people of all ages with a range of injuries. It can be effectively used as exercise rehabilitation for chronic or recurrent neck or back pain, following surgery (e.g. ACL reconstruction, Total Knee Replacements), after a motor vehicle accident as well as pre/post-natal. It can also be of great benefit to the athletic population to assist recovery from sports related injury and prevent reoccurrence. These Physio Rehab Consults provide you with own personalised exercise program that you perform under the guidance of our physiotherapist. Some of the exercises are drawn from Pilates and performed on a piece of equipment called the Reformer: a bed-like frame with a sliding carriage, springs, ropes and pulleys. The springs provide various levels of resistance and difficulty as the carriage is moved along the frame, allowing for a versatile exercise rehabilitation workout. Our Physio Rehab Consults run as either a private session or as a semi-private/small group class (maximum 3 people), allowing close supervision of your individualized program by our Physiotherapist. We recommended private (1:1) sessions when you require more attention and instruction to start with, or just prefer a more personal setting for your exercise program. Following your initial consultation, it is recommended that you perform at least one 1:1 session with our physiotherapist prior to moving to the semi-private sessions. This allows you to become more familiar with your individual program and boosts your confidence and ability in using the equipment. Semi-Private Rehab Consultations are small group sessions which involve one physiotherapist working closely with three clients simultaneously. You will be supervised and guided through your own individualised exercise program with continual reassessment and progression. This option is good for those who want guidance with their exercises but do not necessarily require a one-on-one session. An Initial Assessment is required by all patients prior to commencing our group exercise or rehabilitation sessions. An initial consultation will include a review of your past injury history and current fitness level, a comprehensive musculoskeletal assessment and a discussion regarding your goals. This initial assessment gives us a good understanding of your injuries and an overall picture of your function. Based on this assessment, you will be guided as to what type of exercise session would best suit your needs.